A heaping pile of fresh, powdery snow in Santa Barbara?? This can only mean one thing: the 2018 Santa Barbara Harbor Parade of Lights! 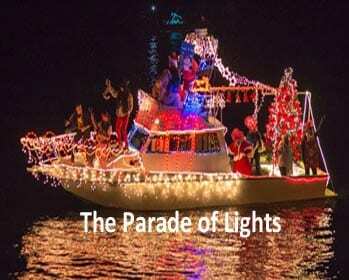 Sunday, December 9th marks the 32nd annual Santa Barbara Parade of Lights. This year’s theme is “Hollywood Holidays” — time to get your glamour on and join the fun! The harbor will be decked out in all its finery, so bring the whole family, come early and stay late to take advantage of all the events. Starting at 3:00pm the City Pier will have Santa’s Village with tons of snow (literally) to get everyone into the holiday spirit. How many times can you jump around in a pile of snow while wearing flip-flops and a t-shirt? Santa’s helpers will be milling around to help entertain the kids, and parents can shop, eat, and enjoy holiday spirits at one or more of the fine restaurants on the Pier. It’ll be fun for the whole family, with some extra holiday cheer thrown in for good measure. At 5:30 the annual boat parade will begin. Approximately 30 festively decorated sailboats, powerboats, kayaks, and canoes will line up to motor, sail and paddle their way around the harbor and up the Santa Barbara coast. The boats will be judged on their creativity in 5 different categories and awarded cash prizes. In our opinion – and we’ve attended pretty much all 31 of these events – the best viewing location is from the breakwater in the harbor. The Pier is also a popular place to watch and wave to the boats as they float by. Bring your Santa hat and dress in layers. Even magical Santa Barbara gets chilly when the sun goes down. 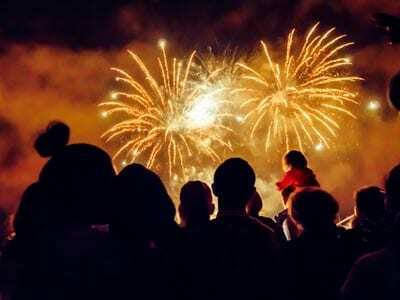 Cap the night off with an awesome fireworks display around 7:00 pm. Snow! Santa! Boats! Fireworks! What’s not to like? Join us and see what all the excitement is about. We’re looking forward to a Hollywood-a-licious good time. And Happy Holidays from the Chandlery Yacht Sales Family to you and yours! For more information about the 32nd annual Parade of Lights, click here.